Pilon in French means "ceiling". 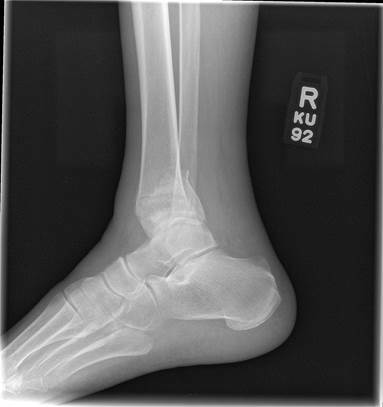 In this injury it is referring to the ceiling of the ankle joint which is the articalar surgace of the tibia. Comminuted fracture from impact of the talus against the tibia articular surface (left). 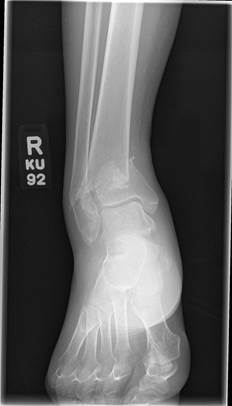 With high energy injuries such as a fall from a great height or a motor vehicle accident the communition could be very severe and involve both the tibia and fibula (right). 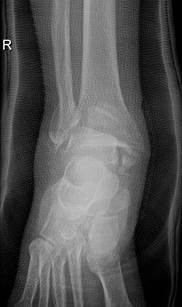 Pilon fractures are very complex injuries. 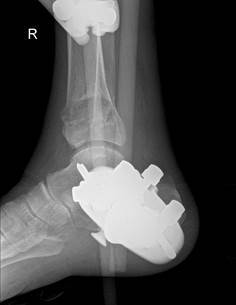 This type of fracture involves the distal tibia and invades the ankle joint. 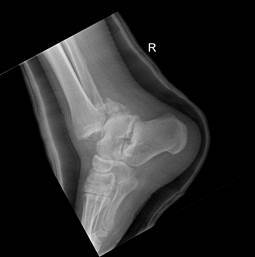 They are usually associated with a fibular fracture. Common etiologies include car accidents, falls from heights and skiing accidents. 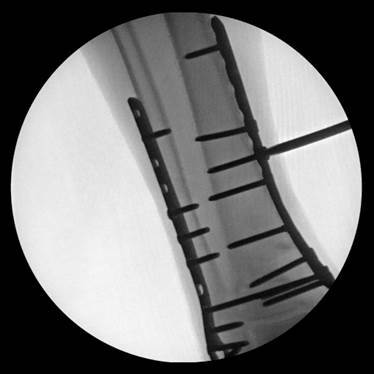 These types of injuries usually are treated surgically due to the involvement of the joint surface, although some are either well aligned or so severe that they are treated non-surgically. 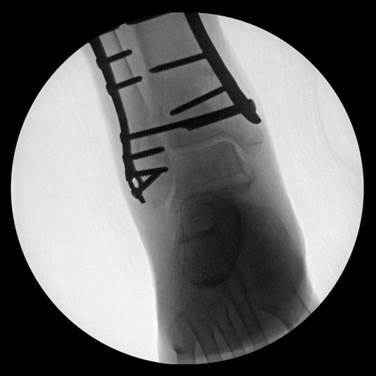 Pilon fractures have a 2 stage procedure for treatment. 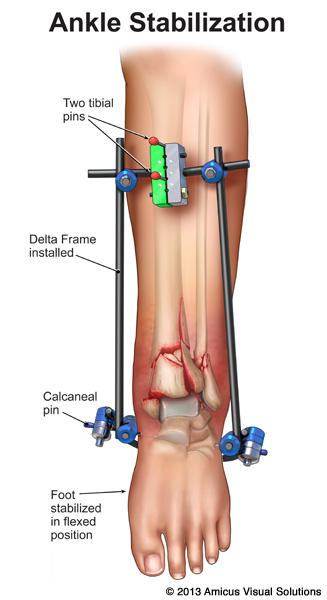 The first stage is usually an external fixator to hold the fracture out to length and in better reduction. That is kept on for 2-5 weeks until the soft tissue is in better condition. The ex fix is then removed and permanent ORIF is performed. 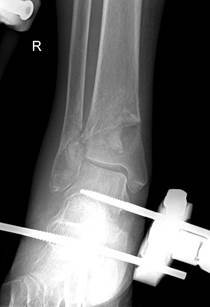 This is a pilon fracture with associated fibula fracture. Due to the high rate of complication, these are staged procedures. 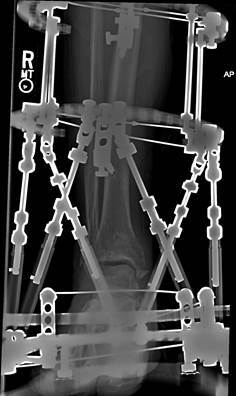 Either an ex fix or first reduction of fibula with our without internal fixation is performed. 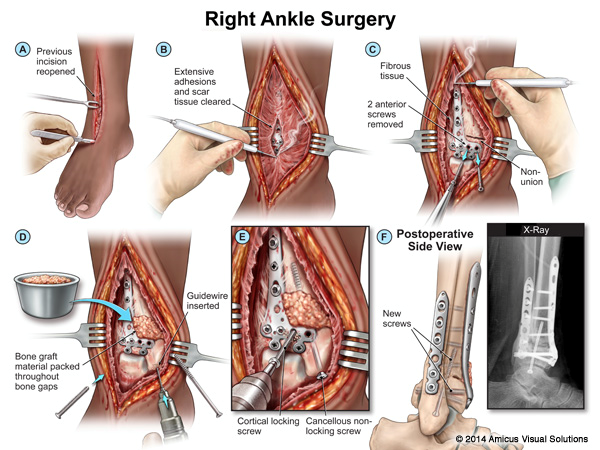 Once the soft tissue envelope is stabilized, a second procedure is performed to reduce the the tibia pilon fracture. 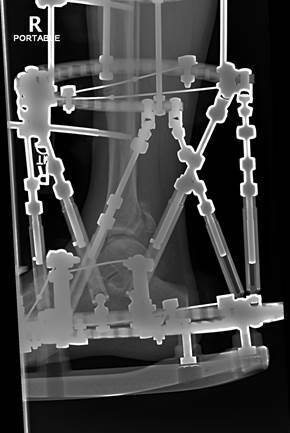 In this case, an ORIF of the fibula was performed to reduce the fractures. 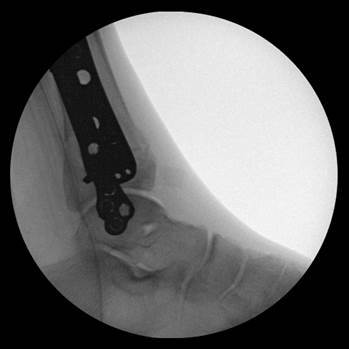 Then a definitive ORIF of the tibia pilon fracture was performed. 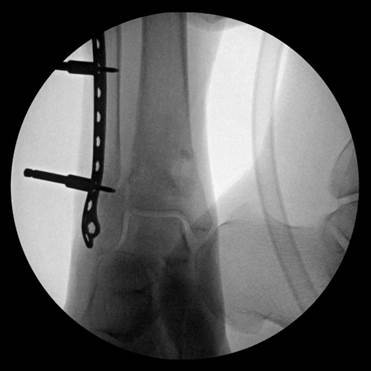 Intraop Pic of COmminuted DIstal Tibia Fracture and Medial Malleolus Fracture during ORIF. 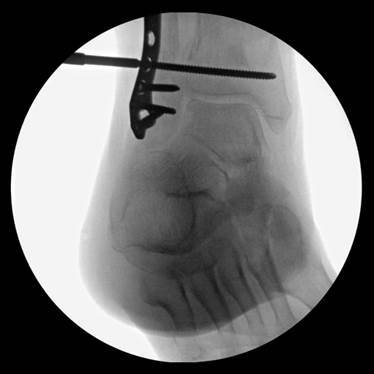 The two pins on the bottom are in the medial malleolar fracture fragent prior to reduction and fixation.